SUNGJU LEE WAS born in Pyongyang, North Korea. He had an idyllic childhood with a good home, a bright future, and parents who cared deeply for him. But as he describes in his memoir (written with Susan McClelland), his life was abruptly turned upside down and became harder than he could have imagined after his father fell out of favour with the country’s brutal regime. As a child, Lee never questions the regime or its leader (first Kim Il-sung and then Kim Jong-il); his greatest dream is to become a general and serve his country. Then he arrives home one day to be told his family is leaving on a “northern vacation.” Lee, who is 11, moves north to Gyeong-seong, where he is immediately shocked by the differences between the capital city where he grew up and what he sees in the rest of the country. 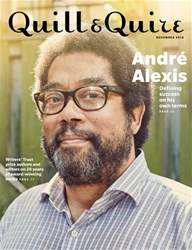 André Alexis, Defining success on his own terms; Writers' trust prize authors and editors on 20 years of award-winning books.